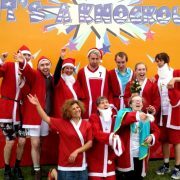 An It’s A Knockout isn’t just for outside events in the “warmer” summer months, but can also be ran indoors and for example for a Knockout Christmas Party event as well. 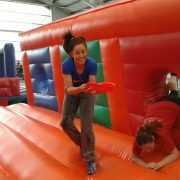 Still lots of fun, still using colourful inflatable obstacles and with dressing up games. The only thing missing is the wet/bubble games (obviously, but also read below*). There are many indoor venues that are capable of accommodating an indoor It’s A Knockout giving a different type of Christmas party for works and also winter and indoor team building events. We can help you find a venue if you don’t have one in mind. Many can also offer food and extra entertainment, some even have accommodation on site making it excellent as part of a multi-day event. Sports halls, leisure centres, indoor sports venues (football/5-a-side/tennis/cricket), there are surprisingly quite a few around to choose from. Please let us know if you need help finding a venue. Our main criteria for an indoor It’s A Knockout venue, is a step free access to the hall with parking directly outside the hall entrance (most have double-doors access outside), and a tall roof for our inflatables. An Astroturf surface (or similar) is also a nicer surface to play the games on. * Earlier in this article, we said that indoor knockout’s usually can’t include the water and bubble games associated with outdoor events. However, we once ran a set of games at an indoor arena that permitted limited use of such (because they had a porous flooring) meaning that we could still run some of our bubble games. 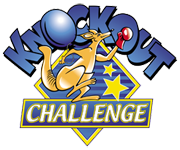 From 30 to 300 people, our games are great for an indoor Christmas It’s A Knockout event. Please browse our Packages Page to see the type of games we offer and then Contact Us to discuss which set of games best suits your requirements.